For the last two weeks, Markus Zusak’s The Book Thief has stolen my undivided attention. This novel captured my imagination and my empathy, being written in a way that is both imaginative and ruthlessly real – surprising, given that the author’s inspiration comes from stories, and not any personal experience of war or persecution. The book’s author, Markus Zusak is a 34 year-old Sydney man (bless the occurrance of Aussie bestsellers that don’t belong to Bryce Courtney! ), whose parents grew up in WWII Germany. Having heard their horrific stories of what went on during that time, Zusak set out to write an original novel on a much written-about topic, which showed “the other side of Nazi Germany” – that side which was very human, and very heartbreaking. We all know about Nazi Germany, we’ve all read a book, or seen a film, or been in a history class or two. What The Book Thief does is take us to this place but look at it from a completely different angle – this book is narrated by Death. Death, in Zusak’s imagining, views humanity in a curious way, trying to prove to himself that we’re not so bad. The novel explores the power of words in that turbulent time in history – both the words of Hitler, and the words that the story’s main character builds a relationship with. This character, Liesel, comes to live with a foster family on a poor street in Munich. She is a generally kind-heated girl, but feels a strong pull toward a life of crime – more specifically, the stealing of books. Her relationship with words grows to be a strong one, and an astounding image in juxtaposition to the power of Hitler’s words at that time. As the war continues and German citizens feel the pinch, believing they are in the worst state of hardship, Liesel words and her ability to keep secrets help her understand that the hardship felt by German citizens is nothing compared to the Jewish plight. While plenty of people have written about Nazi Germany in many a novel, play, and screenplay, Markus Zusak brings something truly original and touching to the subject. He treads a fine line between the magical suspension of reality and the crushing realities of the time. With the exception of the cliche’d use of dictionary definitions to punctuate one chapter of the novel, Zusak handles mood and tone wonderfully, remembering to pace the depressing episodes nicely so that the book doesn’t ever become tiring. Characters are full and convincing, and all strands in this novel come together in a very satisfying way. This is the only novel of Zusak’s that I have read, but his artful use of words leaves me keen to read more of his work. 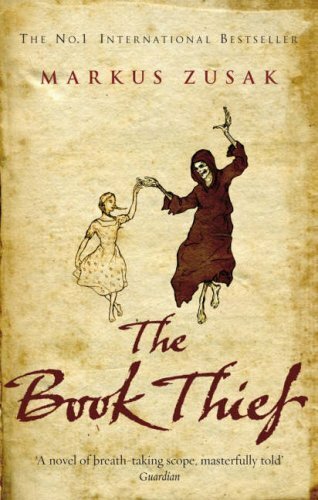 As a book on a tired topic, The Book Thief hits all the right notes – convincing, poignant, consistent and tightly written. One of the best novels I’ve read in a while. yes yes i will read this it sounds awesome! I hope you do Tom, it’s one of those books that puts you somewhere else while reading it. Get into it! I started reading this book when I was overseas while I was in Germany. I went to a concentration camp and it actually became too painful to read. I said to myself “I will read this when I get back to Australia.” I needed to put the distance between the pages and what had happened. The concentration camp was shocking, powerful and even as I think of it know will make me feel a way I cannot explain. However I have not finished reading the book but I really do want to especially since your review was amazing. I too love the use of colours described by Death, it is almost like a playful sort of way. Thanks Shannon! Let me know what you think when you do finish the book. Thanks for the kind words. You should start a blog. Or do you already have one? Send me a link if you do! I have a deviant art website wwww.shannylm.deviantart.com which I post on more often but I find it hard to dedicate myself to that to. I’m not sure, I wish I could get “excited” about modern technology and its opportunities like bloody Lisa Dutheridge (is that her name?) is but I feel like I spend enough time on here and I like to be part of an outside reality too, do I need another addiction? Its also really hard to me to keep a blog without it becoming too personal. I don’t like having a public diary. Thats what I love about your blog, its focused on writing and events and things. Its not a “Look at me look at me I’m Sam Yeah!” Blog. But you have inspired me to do something Sam! I’m going to the 100 book challenge too 🙂 I was thinking about it last night! And i’m going to try and do book reviews too, just because i’m a copy cat.. Hey they say copying is the sincerest form of imitation… And hopefully I will make a million dollars out of your idea or rather MY NAME or YOUR NAME. I’m so confused, can I use your name? Tee-hee. So sad I couldn’t make it to the poetry slam today, I felt like I was going to spew. Isn’t that word just great? Its really raw and like… I don’t know, like when you saw it people want to step away from you in case you throw up on their new shoes or something. I don’t think thats fashionable.. Anyways let me know how it went! The poetry slam, not any form of spewing that may had occured..
Give a blog a go. Just try it. It’s fun. And you wouldn’t be copying me, there’s literally thousands of blogs like mine. Yeh I was sortve in a rambling mood and you kind of got the spiel of it.. Yeh, well what can I say, you’re an inspiration! 🙂 I’m going to write reviews (hopefully) for the 100 book challenge and put them up on my somewhat empty blog. Its good practice and it will make me read books to the end. We’ll start there! Be sure to send me a link for it.